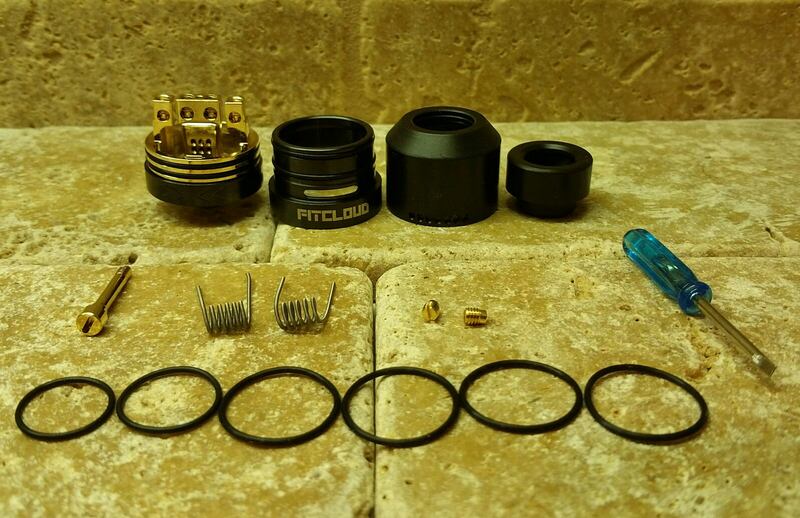 Fitcloud Condor Squonk RDA review by Mjag..Coil painters rejoice! Discussion in 'Atomizers' started by Mjag, Nov 16, 2017. 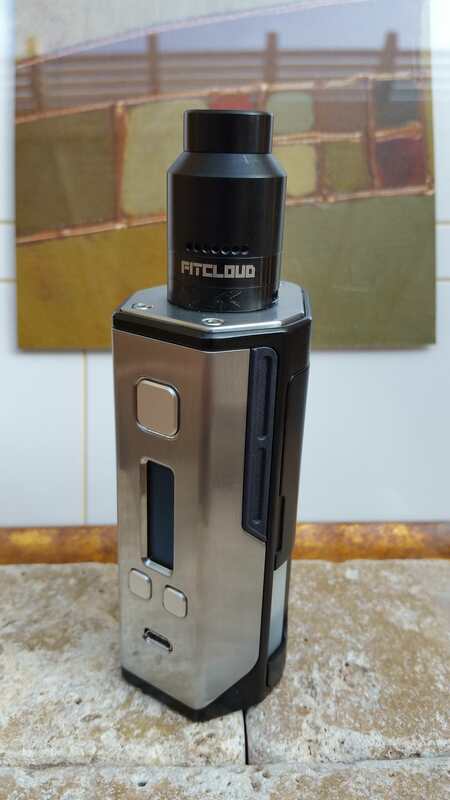 Thank you for taking the time to view my review of the Fitcloud Condor Squonk RDA which was sent to me directly from http://www.fitcloudtech.com for the purpose of this review. Out of the box the build deck and setup impressed me. Normally I am not a fan of slot screws unless they are deep and well sturdy and that was the case here. The openings are also 2.5mm so you can get some decent sized builds in here. Deep 7mm juice well which I always like and there are notches on the top cap and deck so that the side airflow is always in the correct position. The airflow on this is different, there are bottom airflow slots that make there way to the center post which has 6 airflow holes on either side and come out from under the coils. 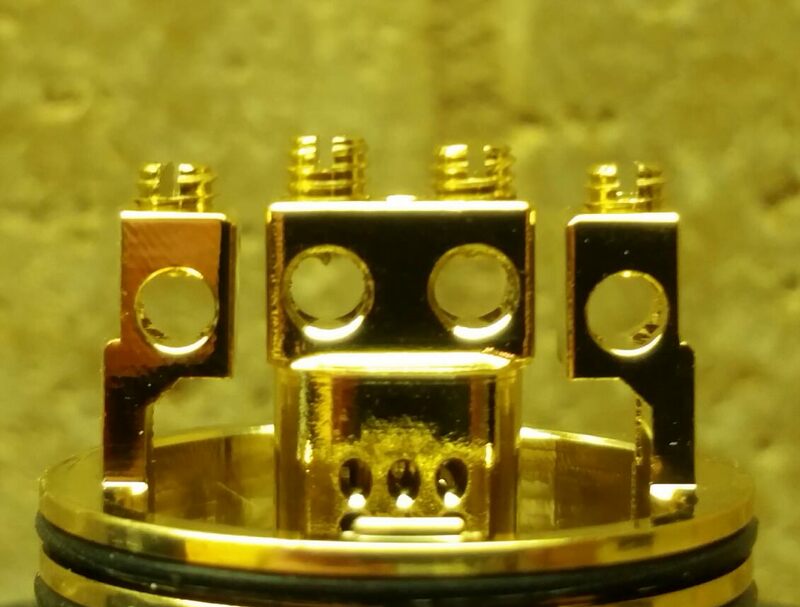 The side airflow is very close to the same height so with your coils situated about even with the top of the posts both airflows enter from underneath the coil, well done. Gold plated deck is a nice touch and well, the top cap appears to be plastic though...hmmmm, not a fan of that but we will see. The 810? 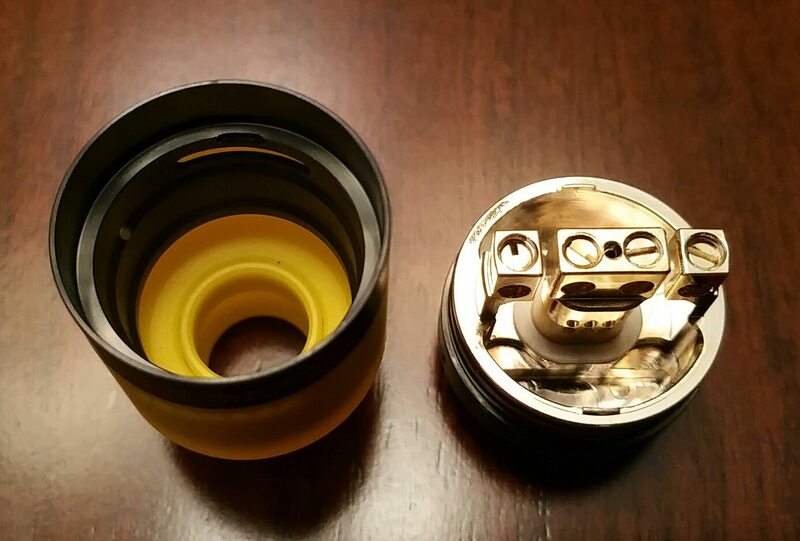 friction fit drip tip is bigger than any other 810 friction fit I have thus I could not use any of my Goon style drip tips but TFV8 style 810's with the dual o'rings worked. Luckily I found the included drip tip to be comfortable and used it for the duration of my review but it would have been nice to be able to use my other goon style tips. Everyone is different but personally I enjoy painting my coils with juice by popping the top and leaving a layer of juice right on the coils. This way I don't have to wait for the juice to work it's way up my cotton from the bottom, I am not the patient type. The Condor gets it right for me, it feeds from the top and right onto your coils, love it. If a tank includes coils I always start off with those as I am sure a lot of people will as well. The coils included are just a plain clapton, if I had to guess I would say 26g core 34g outer kanthal? There spaced already and 3mm inner diameter so I used then as such, great thing with spaced coils is you don't have to spend time getting the coils to glow evenly like contact coils. I left the coils close to the posts, a little space as to not short and possibly get a little airflow between the posts and coils as well. I wanted it close as well so when I fed the deck with the squonk bottle I just had to tilt a little to the right then left so I painted each coil. Wicking was fairly simple, you want enough to reach the bottom of the deck but not too much that you cover the center post air holes. This next pic is from another build I tried, this pic came out better and shows the wick out of the way of the air holes and leaves a nice bed under to stop any possible pooling and thus leaking. The first build was done quick as I had to leave and meet some friends at a local vape shop. Right off the bat though I will say I was impressed with the flavor. I had a few other tanks with me, all with the same juice and when my friends tried the Condor they all commented on the great flavor, first build a success. Here is a little tip on building for this deck and a lot of other decks for that matter. 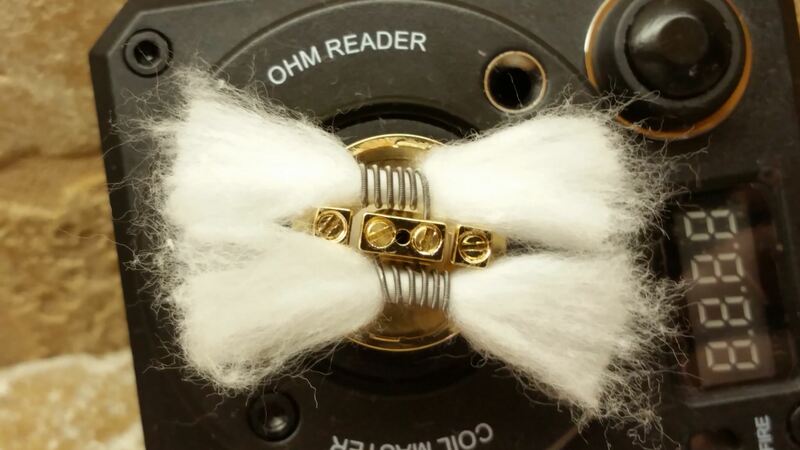 When you install your first coil it is easy to clip your leads then install your next coil. With a deck like this though you next coils positive lead is going to be too long and hit the first coil. All you need to do is push the positive lead into the negative slot and clip it, this way it can be easily installed. I won't bore you with the other 3 or 4 builds I put on here, I will just say that it was a cinch to do all my builds and easy to get excellent results. I will say the bigger the coil the more it messed with airflow, this is definitely not an overly airy tank even with all the airflow open. Even so the flavor I was getting from it was consistently good to great, definitely a flavor tank over clouds bro. The slot screws are holding up really well after all the builds I tried, that is a definite pro in my book. I really ran into no problems with builds, it has held up really well. I never once had a problem with leaking, they did such a nice design of preventing the juice from entering the center airflow holes which I thought might be a problem. They do include a warning about over squonking, I found that 2 squeezes to the left then to the right gave me more than enough juice and no leaks. Hell, there were plenty of times I didn't even know if it needed a squonk, I just painted my coils each and every time before a vape. I did once open it to look and yep, it was full but after awhile I didn't care, I could not get it to leak in normal use. First off I have to say that I have been very impressed with the performance despite what I feel are cons. The painting of the coils this way has me now really hooked on squonking and I bought a Lost Vape Drone based on how much I squonking on the Condor. That said I would have really liked to be able to use my own friction fit goon style 810 drip tips on it, the opening is about .02mm too big. The plastic or possibly delrin top cap is also a bit of a bummer for me although admittedly you never have to worry about bacon lips. The base has a nice style to it but the top cap gives it a cheap feel. The side airflow holes are so tiny you have to use a backlight to see if they are all open. This might contribute to the great flavor I am getting though, hard to say but maybe less but larger air holes? I ran the airflow wide open on both the bottom and sides to get what I wanted but a little more would have been better. The o'rings are tight at first but once wet with juice are way too easy to come off, never try to pick this up from the tank, it will come right off. The top cap would have benefited from being domed, can't really complain about the flavor I am getting though but considering the material used in the top cap doming would be fairly easy on the inside. I haven't been the biggest fan of squonking but my exposure has been limited, what I have tried just seemed like a convenience rather than a revelation. This could be because I am a coil painter, I like to pop the top off and get the juice right on my coils. The squonk RDA's that just squonk to the bottom of the wicks have left me wanting. A great example of this is the Conspiracy RDA (review coming soon) which is an excellent RDA but I enjoy using the Condor when squonking, the Conspiracy I mainly use on regular mods and paint my coils. What can I say, I am an impatient punk who wants his juice on the coils NOW and as saturated as I can get them. The build deck is excellent on the Condor and Fitcloud has really put some thought and innovation into it, kudos to them. I am a squonk convert now thanks to the Condor and hope they come out with a new version that addresses some of the cons which realistically are easy to overcome. I think they have a great squonk RDA here though and if you like to paint your coils like I do then you will want to pick one up. Looked around the net but not finding it at too many places for sale, here is what I found. Please note that these are not affiliate links nor do I have any interest in these companies, it was just all I could find at this time.